Best Projects to Handle with Your Pressure Washer | 41 Lumber - Serving Iron Mountain and the U.P. Pressure washers have been very popular in recent years --and with good reason. They are extremely versatile tools that save a lot of time, often with great results. A lot of cleaning can be accomplished in a little amount of time. Some jobs can be accomplished so quickly in fact, that when renting a pressure washer it may be a good idea to line up a couple of jobs to get the most for your money. For example, after pressure washing the deck, why not give your driveway the treatment? For lawn and garden uses, pressure washers are ideal for keeping your equipment clean and ready for use. Nothing removes caked on grass and debris from under the mower deck as effectively as a pressure washer. Tiller blades can also benefit from a pressure washer. Keeping your lawn and garden equipment clean can prevent a lot of rust and corrosion down the road. For home cleaning projects, a pressure washer is the right tool for the job. Cleaning your siding, deck, lawn furniture, driveway and sidewalks are just a few of the jobs that are well suited for a pressure washer. Hard to reach areas can easily become not so hard to reach. Difficult to clean items such as shutters, wrought iron fencing and lattice all come clean with ease. A pressure washer can also effectively clean your brickwork and stonework such as patios, steps and barbecues. When cleaning your driveway or garage floor with a pressure washer, it is a good idea to first soak up any oil with cat litter. Once the litter is swept up, apply degreaser to the oily areas and allow it to stand for a few minutes before beginning to pressure wash. When working on the wood, it is recommended to keep the stream at a 45° angle. Avoid spraying head-on or keeping the stream in one place. That way you can avoid indenting or scarring the surface. Also, avoid spraying directly onto glass as it may break under the pressure. Your vehicles, such as trucks, cars, boats, trailers and campers can be effectively cleaned with a pressure washer. Special attachments are available specifically for washing your vehicle. If you are renting a pressure washer, with all of the time you’ll save on your other projects, why not treat yourself to a car wash? Another once tedious project that pressure washers have been popular for is for the removal of peeling paint. Though care must be taken not to damage the wood surface, professional results can be achieved quickly without having to use a paint scraper. Finally, about safety: No matter what your project is, be sure to read all provided materials so that you can safely operate the equipment. 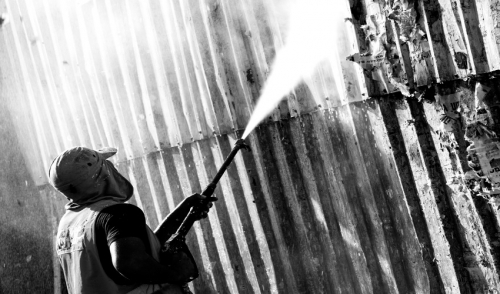 As powerful as pressure washers are, they can quickly cause damage to yourself, others or your property. Always be aware of your surroundings. Also avoid using one on a ladder, as the kickback can take you off balance. Finally, know where power lines and outlets are to avoid electrical shock.